If we were uncertain where Sony’s control over these Spider-Man properties would lead, one thing Venom does is really set the record straight on how these characters will be used; by that I mean, probably not at all. The poor reaction to Venom likely signals at least an intermittent end to the competing focuses of Sony’s use of the property and Spider-Man’s use in the MCU. In fact, one of the many drawbacks of this movie is the lack of a Spider-Man influence to begin with. I had always assumed that the reason Venom took on so many Spider-Man qualities was because the alien symbiote had originally attached to Spidey and taken so many of his characteristics. So by the time it ended up in the hands of Eddie Brock, their merge into Venom was a foil to the Spider-Man character. In this iteration, Eddie is actually our protagonist, a web-journalist who hosts inflammatory documentary series’ about various problems affecting his hometown of San Francisco. He has a long-term girlfriend, an attorney named Anne (Michelle Williams). His boss gives him a new assignment, interview the tech mogul Carlton Drake (Riz Ahmed) whose Life Foundation and obsession over space exploration has yielded a grouping of alien symbiotes which strengthen and immunize the human body, but need a perfect host to match correctly. Drake begins testing them on human subjects soon after acquiring them, showing his indifference, which Eddie wants to ask about in the interview after obtaining some insider information from a problematic source. The fallout from Eddie’s questioning leads him to be bonded to one of the symbiotes, Venom, which changes Eddie’s life for good. The one totally positive to take away from this disastrously uneven movie is that Tom Hardy is totally game for wherever this performance takes him. He plays Eddie with some of his trademark quirkiness, but then goes all in when doing the scenes showing the physical effects of having this symbiote inside him. A particular scene in his apartment, or one in restaurant involving a tank of lobster is hysterical, and his schizophrenic approach to dealing with Venom’s voice in his head is great. As the movie turns less about the invasion of his personal space and more with Eddie’s bromance with Venom, Hardy steals essentially every scene. It just so happens that Hardy’s performance is the only thing worth complimenting in this movie. First, the visuals are really disappointing. The studio decided to push a PG-13 rating, so Venom’s action scenes all occur in the dark or in the shadows, where you can’t see him bite people or break limbs. In the scenes you do actually see up close, the vast amount of computer generated imagery leads to a cartoonish, early 2000s look that lingers somewhere between campy and unforgivable. It’s not as bad when Venom is just fighting some goons, but when the other symbiote breaks out and becomes the villain Riot, the ensuing fight is just a scrambled mess on the screen. The movie completely fails to capture the action part of the comic book genre, and relies entirely on the darker, quirkier comedy to carry the movie. That would be fine, except that outside of the aforementioned scenes of Tom Hardy going all in, the script doesn’t do much to actually set up more than a few worthwhile gags or memorable lines. There’s a ton of inner-dialogue between Venom and Eddie that really is cringe-inducing, both because of its uneven attempt at comedy and its relation to the rest of the plot. I think that Eddie and Venom’s relationship is the best part of the movie, but there’s still a ton of dialogue there that suffers from being poorly written. I also feel like Riz Ahmed and Michelle Williams are both miscast here. Williams is a fantastic dramatic actress, who has a few scenes of actual acting here, but she spends most of her time running a few steps behind the plot. She just doesn’t portray what the movie wants her to: that she could take over the protagonist duties if something happened to Eddie. I think the reason they cast both Hardy and Williams was to keep the whole She-Venom idea open in case one of them declined a sequel, but she isn’t exactly a ferocious or commanding actress, she’s always been more about subtlety. Also, Riz Ahmed is good in certain instances, but as a greedy mad scientist, he seems more like a kid pretending. That clearly was not supposed to be the point. All in all, you may enjoy small portions because of Tom Hardy, and like I say in a lot of these movies, there’s a good movie buried somewhere beneath the surface. That movie is probably more like an uber-violent, shifty, mental mess like an Evil Dead kind of style. This is not that movie. First Man is a continuation of director Damien Chazelle’s exploration of these career-obsessed leading men, but this time takes a true story to work through. This is a much different movie than the colorful and explosive Whiplash or La La Land, but it features some great visuals and some good performances at the very least. Chazelle is now three-for-three in quality films, but to expect that this young director makes a complete classic every time out is a little bit unfair. 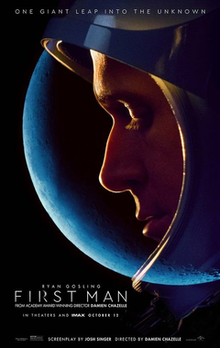 The story works through Neil Armstrong (Gosling) as he is elevated through the ranks at NASA and works on various elements of the United States push for space travel. To start, it was clearing the atmosphere and doing an orbit, then, it was attaching to a larger vessel, and finally, it was actually shuttling men to the moon. The focus on these huge missions takes away from his relationship with his children and his wife (Claire Foy), especially after losing one daughter to cancer and countless colleagues to the risk of the space travel. There are so many positives which make First Man worth the price of admission, specifically the scenes which take place in the shuttles, where the rattling and hand-held camera make it literally feel terrifying for Armstrong to be a part of what’s being attempted. Then, when the moon landing finally occurs, there are sweeping, silent shots that gave me chills. The technical aspects of this movie are really well handled, and there are some emotional scenes involving his daughter that come full circle by the end in a powerful way. All of this would’ve led me to view this film as a massive achievement if it wasn’t for some of the slow-down in the middle, where years pass and projects succeed and fail. The story ceases to be told from Armstrong’s perspective and becomes more a chronology of events from afar, and the movie really loses its place as an affecting drama with excellent upticks of action. The previously intimate moments seemed really removed and cold, almost clinical, and the previously silent but tender Gosling performance becomes something closer to robotic stand-in for a real person. Somewhere along the way, Chazelle loses the point and narrative heft of the story he’s telling because of the obsessive detail about every little part of the production design being in place or every little part of the lead-up missions being mentioned. The first 30 and last 30 minutes are as excellent as any movie I’ve seen this year, but the middle hour really feels like a documentary and not a dramatic story. The technical aspects of it never stop being great, however, and overall, this is a movie with plenty of positives. Telling the same story through six perspectives is a tough sell when it never feels like anything new is being done. Bad Times at the El Royale chases its tail for quite some time, hiding behind a great set-up, concept, and enclosed production design while its characters flounder in something pretty mediocre. There’s a heat-up which drags the movie out of mediocrity into something interesting, before it dives back in with a maddeningly ordinary ending. The last thing this movie should be is ordinary, but it often feels so. The El Royale is a motel which is split between the California and Nevada border, known for some nefarious activities which occur there. Our night-of guests are a bumbling priest (Jeff Bridges), an aspiring singer (Cynthia Erivo), a mysterious ingenue (Dakota Johnson), a plaid-clad businessman with a faulty accent (Jon Hamm), and the hotel concierge who is hiding something (Lewis Pullman). As we learn about secret tunnels, secret cameras, a sum of money, and a cult led by Chris Hemsworth, the characters’ paths all intertwine. The problem with the script’s set-up is that it does too things which give the movie a real lack of rhythm. First, it works really hard to set up its characters as more than just a quirk for the purposes of comedy, and the narrative choice was to give each important character a significant flashback to explain their backstory and then attempt to cut back into the main through-line of the film. This made the pace really troublesome and the movie tough to become invested in because of how long we’d spend away from the main focus. Then, rather than allow the plot to consistently move forward, they again pause the narrative and tell the same five minutes from another person’s perspective. There’s occasional moments where this is interesting, but it’s a lot of unnecessary re-tread. So, not only is the narrative paused while we get a bunch of flashbacks, but then we also pause the narrative and rewind five minutes to re-tell the story frequently as well. As much as this was designed to be interesting and unique as a narrative structure, the final product is this bloated mess which doesn’t really hit its stride until it is finished with the flashbacks and we start getting some violence and the presence of Chris Hemsworth, who turns in an excellent supporting performance once he enters the film. For a segment of the movie, it really hit the violent but comedic tone it had striven for with the aura of mystery, but it’s just so short-lived. Dakota Johnson is also really good here, as well, but she’s wasted in the manged story-telling. Cynthia Erivo is also really good, and I’d never seen her in anything before. It’s a shame it never came together. In his final screen performance, Robert Redford continues what has defined his career in recent years. He just does everything he can to appear like the movie star of yesteryear, charming, intelligent, mildly complicated, and compelling. This is a movie directed and presented in the style which Redford dominated in the 70s. There isn’t a dark undercurrent behind his kleptomania, and it instead tells a straightforward narrative with a grouping of decent performances. It’s nice to see the director of A Ghost Story of all things be able to understand some of the escapism that can be accomplished in dramatic film-making. Redford is the Old Man, named Forrest Tucker, a notorious bank-robber who works in a small group, and who has also orchestrated a large grouping of prison escapes during his historical career as a petty criminal. He’s not violent, and in fact, does everything he can to not intimidate those who he steals from. He shows the handle of his gun, asks nicely for the money, has a chat, and strolls out the front door. When the police, this time it’s Det. John Hunt (Casey Affleck) on his tail, ask the victims at the bank what happened, they all shrug off the robbery as if it wasn’t remotely a traumatic experience because of how gentlemanly the robber was. Redford, while compiling all of this cash, also begins dating Sissy Spacek’s Jewel, who offers him some companionship in his later years. This isn’t the movie you go to in an attempt to learn about complicated characters. We get a slight home life from Det. Hunt’s perspective; he has an African American wife in the 1970s, but the movie is not interested in giving us any more than that. With Forrest, he’s just a successful criminal who’d been caught a few times and escaped. When we meet him and learn about him, he smiles at everyone and pursues a romance with another local retiree. The bright and crisp tone is the movie’s biggest strength, backed by a really solid Redford who nails the robbery scenes and conveys his wisdom but also his old age in a really good way. It may not be a particularly nuanced performance, but he steals every scene he’s in. Affleck, as an actor of constant seriousness, may be a slight miscast as this Detective, and it’s the actual pursuit of the criminals by the police that’s the movie’s biggest issue. I just didn’t care about the hunt for Forrest, and the movie didn’t need any particular attempt at plot tension. It was perfectly fine floating along in the fantasy of bank robbing without any consequences and in the fantasy of being this resourceful at Redford’s age. The criticism here is that there’s not much substance and most of the attempts at substance are inconsequential. As for the everything else, this is an enjoyable movie to sit through. Colette is a story about so many themes, including sexuality, marriage, marital property, plagiarism, and gender. It continues in a similar vein as The Wife from earlier this year in that it features a beautiful writer as a wife and a business-oriented husband who takes credit for a majority of the work. If The Wife focuses on the old age fallout of such an arrangement, Colette is the entire life-story of the party. The story begins when Willy (an excellent Dominic West) marries a young maiden named Gabrielle (Keira Knightley who eventually goes by Colette). Willy is a publisher/entertainer, trying to do anything to grow his brand with anything from food criticism to fiction. He realizes soon that his wife has a real knack for fiction, so he begins locking her in an office and having her write the stories of ‘Colette,’ a sexually repressed and introspective protagonist which sells really well to female readers. Over time, the popularity is immense, but Willy’s own demons (such as drinking and gambling) hold back their advancement. In addition, Colette’s budding sexuality starts including women and extramarital affairs, which is agreed to by Willy as an open relationship because of his own infidelities. As their marriage deteriorates after a once fruitful business relationship with open doors socially turns into a spiteful and controlling affair, Colette leaves, and the film shifts to the focus on her crusading for more expansive media and her desire to have the books put in her name for copyright purposes. If all of that sounds like a lot, it’s because it is. The movie can’t decide whether it wants to be about the marriage, the exploitation of women during that period, sexual promiscuity and the vindication in an eventual liberation movement, or the role of gender as it plays in larger business. All of the characters and people we meet have individual quirks which inform the theme of some, if not all, of those ideas. As disappointing as it is, this movie isn’t always a sum of its parts, but rather a bunch of parts which never are glued together into a sum. However, the performances, especially the lead ones of West and Knightley, are just absolutely excellent. An objective review here would point out all of the problems with the structure of this movie and commend the performances and the costumes. My personal viewpoint really coincides with that assessment. One of the reasons I waited awhile to publish these reviews is that I was still trying to narrow down exactly how I felt about this one. A modern neo-Western which blends in some dark comedy elements, The Sisters Brothers takes a brotherly concept and mixes plotlines about bounty hunting and the regaining of innocence in a time where very little innocence was practicable. For some, the conflicting tones of this movie would be interesting, but outside of enjoying large portions of this movie, I ended up leaving with a bad taste in my mouth. The Sisters Brothers are Joaquin Phoenix as the drunkard but deadly accurate with a gun Charlie, and practical/caring but still deadly John C. Reilly as Eli. Their employer tasks them with the assassination of Riz Ahmed’s Hermann K. Warm, a chemist who has devised a way to glean gold from the riverbanks through a formula placed in the water. The Sisters Brothers are really only there for the final assassination, as it’s Jake Gyllenhaal’s John Morris who has infiltrated Warm’s camp and befriended him. The remainder of the film includes angry mercenaries, unlikely friendships, and cool location placements for our main characters. There’s not a ton of action or gunplay for a western. For the most part, this is more about the journey that these brothers take during their assignment, and we learn about their familial dynamic over time. Both Reilly and Phoenix are game for really good performances, and then we cut away to the budding friendship of Gyllenhaal and Ahmed opposite the Brothers/assassins. All of the cinematography is excellent, as are the performances, and when the four characters eventually come together, the film hits this highpoint and then begins sinking slowly for the remaining hour. The tone shifts from dark comedy in a western setting with great performances to something much darker and solemn, and that change felt really unwelcome considering the rest of the movie. There’s a shift that puts our characters in serious peril, and it made me wonder why it was necessary to go through all that we had been though. Then, the final scene of the film was meant to be something full-circle, but at that point, I had largely checked out of the film emotionally. 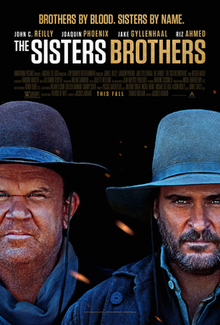 I think this is a movie that will need to be analyzed a few times to determine whether it was actually successful in what it was going for, but overall, I’d only barely recommend The Sisters Brothers.